"The Fanes' saga - researches on the legend - G:Innerebner's researches on the Fanes Alp"
I knew since a long time ago that eng. G. Innerebner had performed, in the yet remote year 1953, an archaeological research in the Fanes piccola basin and had located what he believed to be the impressive ruins of an ancient stronghold. Later on, a geological investigation had defined the huge heap of debris a completely natural formation. Thanks to mr. Benno Baumgartner’s courtesy, deputy director of the Museum of Natural History of Bolzano, I recently had the chance to read the communication, appeared on the magazine “Der Schlern”, where Innerebner notified his discovery. In the following, I’m providing its translation, partially summarized, and also a short personal remark. From “Der Schlern”, 1953, pg. 292 ff. 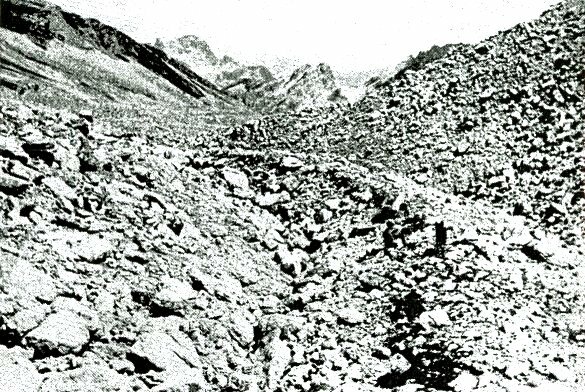 In my essay “The Schwarzhorn and the Weisshorn*) as pre-historical sites”, that appeared on “Der Schlern”, 1950, p.297, I already had stated the the appearance of the name “Burgstall**) ”, even in high altitude areas that today are uninhabited, should mark a reference to pre-historical ages. Since then, I obtained some further results in this direction that strengthened my opinion to the point of turning it into a firm belief. The finding of unquestionably pre-historical pottery fragments in the “Ciastel” area, which is located in the middle of the stone desert surrounded by the mountains of Fanes Piccola, over 2800 m above sea level, on St.Ann’s day°) this year, provided me anyway with the final evidence for it. The Group of Fanes in the Eastern Dolomites, self-enclosed and until now quite unfrequented, desert and silent, is bordered and encircled by the San Vigilio valley on the North, the Travenanzes valley on the East, the San Cassiano valley on the South and the Badia valley on the West. Its highest portion, named “Fanes piccola”, consists of a mountain basin perfectly circular in shape with an area of about 20 sq.km., closed by a ridge of high peaks and only open eastwards. Geologically, this peculiar Dolomitic basin in its marginal extensions pertains to the lower formations of Jura (Lias), while its less steep central core, that slopes eastward like a slow stair, is composed by the “remains” of still well stratified formations of recent Jura and early Cretaceous periods. Roughly in the middle of the external arch, that falls abruptly westwards into the Badia valley, we can observe close to Cima Dieci [Ten Hour Peak], 3023 m high, an isolated castle of rock, high, pathless and totally unfrequented, towering about 150 meters above the basin. It can be quite easily distinguished from its surroundings, where the rock is well layered with a strong bias, because the banks of this rock outcrop are perfectly horizontal and therefore demonstrate to be a separate island of a later age. The highest point of its ridge, which attains an altitude of 2657 m, is almost 300 m higher than the highest point of the surrounding area. At the point of attachment, a small but clearly marked saddle takes shape, 2605 m above sea level, and from here the cliff, elsewhere surrounded by vertical walls, can be climbed through a debris slope, steep but presenting no difficulties. From the saddle, the terrain slopes abruptly southwards, while on the northern side it descends more gently into a depression filled by stone debris, turned towards the basin of the Alpe di Fanes piccola. Now, in this depression one can find, amid a huge stone sea, the remains of a powerful circular curtain of walls, laying almost horizontally and with a diameter of over 60 meters; its southernmost portion is very well preserved for a length of over 50 meters and therefore allows a good reconstruction of the global plan (fig.1). To the West, this circular wall leans with two sides on the smooth wall of the incumbent Cima Dieci, but to the East it is prolonged towards the valley basin of the “Ciastel”. There the crown reaches an average external height of several meters and its section shows a width of four meters, broadening up to 10 meters where it reaches the natural slope. 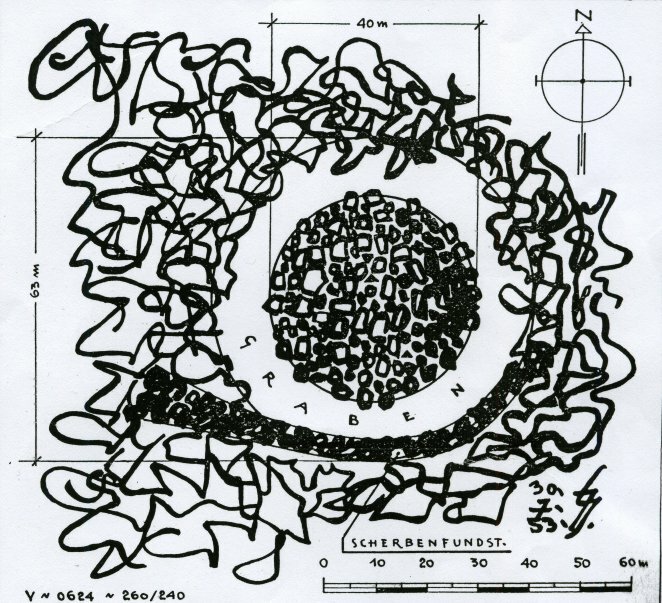 Inside the walls, one can easily follow all over the circle the corresponding moat, circular as well, in the average 7 meters wide and today almost two meters deep, although partially filled by rock debris collapsed outwards (fig.2). The central part of the settlement consists of an almost regularly-shaped dome, well elevated, but consisting of just rock debris, its highest point attaining four meters over the top elevation of the curtain wall. Here we might certainly be dealing with the remains of an enormous thick-walled tower, collapsed over itself, the plan of which strongly reminds me of the Sardinian nuraghi. As a matter of fact, it is unquestionable that we are dealing with a workpiece of man; moreover, not only the shape and type of the building, but also the retrieval of pre-historical pottery shards within and around the wall curtain itself, demonstrate that we have here a construction from the grey-shaded remote antiquity and not a remain – in theory not impossible – of the first World War. With this discovery, that I performed on July 26,th, 1953, the evidence has been provided that once man lived and dwelled even at such altitudes, while for the moment the global size of this settlement and its collocation in time are certainly yet undefined. Anyway, we can already state now that we are dealing with a sizable settlement, having its acropolis on the “Ciastel”, that likely covered the whole area known today as Fanes piccola. This assumption is base on the retrieval of pottery shards around the stronghold, on the overall structure of the territory and on the rich legendary corpus connected with this region. The finding of part of a handle in coarse pottery indicates that the settlement should date back to the Bronze Age. Unfortunately, on the mountain top of the Ciastel itself, until now we have been unable to dig out of the black earth even minimal quantities of pottery or remains of buildings, anyway at present the most important point, I would say, is unquestionable, that is, it has been demonstrated that the complex can be considered as a pre-historical dwelling. In the broader surroundings on the area of Fanes piccola we can also find several examples of quite remarkable caves, that can be connected with the above mentioned discoveries. In detail, the cave situated south of the Ciastel deserves a special attention, in my opinion, as it shows being a part of a glacial pot, with a diameter of 8 meters originally, and under all aspects, size, layout, features, looks like the Stoppani settlement at Vezzano, in the Sarca valley, a glacial pot that was inhabited during the Stone Age. This discovery also sheds a quite different light on the rich legendary world of the magic Kingdom of Fanes, and also the various beings hidden in the world of mountains, like Salvans and Gane, until now just mentioned as legendary characters, begin turning into the subconscious remembrance of pre-historical age people whose existance is ascertained. Contrary to the previously current opinion that the pre-historical settlements were strictly limited to the lower altitudes, the discoveries of the latest years [Burgstall/Schlern 2510 m (Malfèr), Schwarzhorn 2439 m (Innerebner), Königsangerspitze°°) 2439 m (Oberrauch) and the “Ciastel” of Fanes, at 2657 m above sea level the highest pre-historical settlement until now ascertained in Europe], demonstrate that in Europe there is virtually no altitude limit for pre-historical settlements, and therefore the pre-historical researchers of our region should definitely be more attentive at the place names at high altitudes that can be traced back to walled towns; the “Burgstall” in the Sextner Dolomites (2218 m), the Laugenspitze^) (2433 m), the Paganella (2125 m), the Odle^^) Group (Caslir!) are just a few of these places, that since now should be taken into an even more serious consideration as probable sites of pre-historical settlements. A specific task for the competent Authorities should also be to prepare the means and have the field activities carried to their end, both as far as the already undertaken pre-historical researches are concerned, and in general, in order to attain and support further new knowledges of a so high importance. Fig.2 The Southwest portion, in a good preservation state, of the huge ring of walls (left of which are the inner moat and the debris of the tower building; at right is the northren slope of the “Ciastel” separated by a terrain depression). Georg Innerebner (1893-1974) was, therefore, no professional archaeologue, bust just a passionate amateur (his fame is mainly due to an essay on Alto Adige castles and to his activity as an archaeoastronomer), and his “expedition” to the Ciastel di Fanes wasn’t but a sunday excursion he performed together with his daughters. Unfortunately his most sensational finding, the “stronghold”, has been contradicted by geologists. But also the pottery he collected in the area is very interesting; pottery I have no further cognition about, either where it may lay today, or whether it has been dated with a less empirical criterion than “it is coarse, therefore it must be vey old”. The news about the finding raised a lot of noise in the Marebbe valley at the time, and as far as I know many local people combed the area later on (rumours are that they found a “skull”, o maybe just a skull-shaped stone). It looks then quite improbable that anything new might be found on the surface. I have no news, anyway, about any digging, or any essay of digging, in the area.